Concert # 115 with the 12th Never-Ending Tour Band: Bob Dylan (vocal & guitar), Charlie Sexton (guitar), Larry Campbell (guitar, mandolin, pedal steel guitar & electric slide guitar), Tony Garnier (bass), David Kemper (drums & percussion). 1–6, 15, 18 acoustic with the band. 11, 12, 18 Bob Dylan harmonica. 1, 6, 16 Larry Campbell & Charlie Sexton (backup vocals). 10 released on TELL TALE SIGNS: THE BOOTLEG SERIES VOL. 8 RARE AND UNRELEASED 1989-2006, Columbia CKC 735797 (DeLuxe Edition), 6 October 2008. This was a warm-up show without Phil Lesh. Live debut of Searching For A Soldier's Grave. First live performances of Standing In The Doorway. 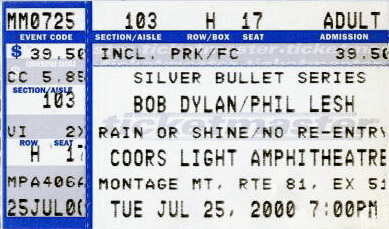 Second live performances of She's About A Mover, the first being in Edmonton 24 August 1988 with Doug Sahm on lead vocal. Session info updated 5 September 2013. Concert # 1211 of The Never-Ending Tour. 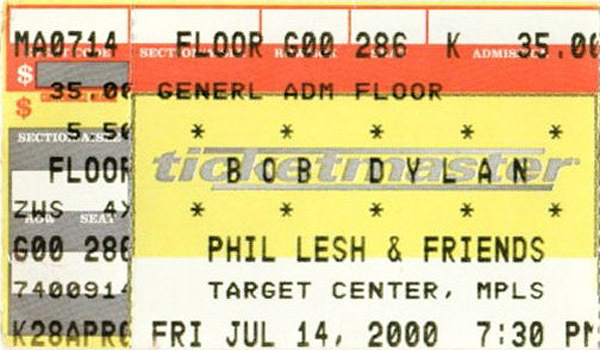 Second concert of the 2000 US Summer Tour with Phil Lesh And Friends. Concert # 116 with the 12th Never-Ending Tour Band: Bob Dylan (vocal & guitar), Charlie Sexton (guitar), Larry Campbell (guitar, mandolin, pedal steel guitar & electric slide guitar), Tony Garnier (bass), David Kemper (drums & percussion). 1–6, 15 acoustic with the band. 6, 11 Bob Dylan harmonica. 1, 2, 3, 5 Larry Campbell & Charlie Sexton (backup vocals). Note. The first of a series of a concerts without songs from Time Out Of Mind! 10 new songs (62%) compared to previous concert. 10 new songs for this tour. Session info updated 3 June 2011. Concert # 1212 of The Never-Ending Tour. Third concert of the 2000 US Summer Tour with Phil Lesh And Friends. Concert # 117 with the 12th Never-Ending Tour Band: Bob Dylan (vocal & guitar), Charlie Sexton (guitar), Larry Campbell (guitar, mandolin, pedal steel guitar & electric slide guitar), Tony Garnier (bass), David Kemper (drums & percussion). Note. Second live performance of Long Black Veil. 9 new songs (52%) compared to previous concert. 7 new songs for this tour. Session info updated 30 March 2010. Concert # 1213 of The Never-Ending Tour. Concert # 4 of the 2000 US Summer Tour with Phil Lesh And Friends. Concert # 118 with the 12th Never-Ending Tour Band: Bob Dylan (vocal & guitar), Charlie Sexton (guitar), Larry Campbell (guitar, mandolin, pedal steel guitar & electric slide guitar), Tony Garnier (bass), David Kemper (drums & percussion). 1, 2, 6 Larry Campbell & Charlie Sexton (backup vocals). 5, 11, 15 Bob Dylan harmonica. Don’t forget to support your local library! (after This World Can’t Stand Long). I only played that song because, of course, it’s Father’s Day! Happy Father’s Day!! (after House Of The Risin’ Sun). First live version of House Of The Risin' Sun since Paris, France 7 October 1987. 10 new songs (62%) compared to previous concert. 8 new songs for this tour. Session info updated 9 May 2014. Concert # 1214 of The Never-Ending Tour. Concert # 5 of the 2000 US Summer Tour with Phil Lesh And Friends. Concert # 119 with the 12th Never-Ending Tour Band: Bob Dylan (vocal & guitar), Charlie Sexton (guitar), Larry Campbell (guitar, mandolin, pedal steel guitar & electric slide guitar), Tony Garnier (bass), David Kemper (drums & percussion). 11, 15 Bob Dylan harmonica. Note. First live version of The Ballad Of Frankie Lee And Judas Priest since Rochester Hills 18 July 1988. 11 new songs (68%) compared to previous concert. 8 new songs for this tour. Concert # 1215 of The Never-Ending Tour. Concert # 6 of the 2000 US Summer Tour with Phil Lesh And Friends. Concert # 120 with the 12th Never-Ending Tour Band: Bob Dylan (vocal & guitar), Charlie Sexton (guitar), Larry Campbell (guitar, mandolin, pedal steel guitar & electric slide guitar), Tony Garnier (bass), David Kemper (drums & percussion). 10 new songs (62%) compared to previous concert. 3 new songs for this tour. Concert # 1216 of The Never-Ending Tour. Concert # 7 of the 2000 US Summer Tour with Phil Lesh And Friends. Concert # 121 with the 12th Never-Ending Tour Band: Bob Dylan (vocal & guitar), Charlie Sexton (guitar), Larry Campbell (guitar, mandolin, pedal steel guitar & electric slide guitar), Tony Garnier (bass), David Kemper (drums & percussion). 10, 11 Bob Dylan harmonica. Note. First live rendition of The Wicked Messenger since Indiana 22 April 1997. 11 new songs (68%) compared to previous concert. 5 new songs for this tour. Concert # 1217 of The Never-Ending Tour. Concert # 8 of the 2000 US Summer Tour with Phil Lesh And Friends. Concert # 122 with the 12th Never-Ending Tour Band: Bob Dylan (vocal & guitar), Charlie Sexton (guitar), Larry Campbell (guitar, mandolin, pedal steel guitar & electric slide guitar), Tony Garnier (bass), David Kemper (drums & percussion). 5, 11 Bob Dylan harmonica. Concert # 1218 of The Never-Ending Tour. Concert # 9 of the 2000 US Summer Tour with Phil Lesh And Friends. Concert # 123 with the 12th Never-Ending Tour Band: Bob Dylan (vocal & guitar), Charlie Sexton (guitar), Larry Campbell (guitar, mandolin, pedal steel guitar & electric slide guitar), Tony Garnier (bass), David Kemper (drums & percussion). 1–6, 15, 17 acoustic with the band. 10, 11, 15 Bob Dylan harmonica. 9 new songs (52%) compared to previous concert. 2 new songs for this tour. Session info updated 25 November 2013. Concert # 1220 of The Never-Ending Tour. Concert # 11 of the 2000 US Summer Tour with Phil Lesh And Friends. Concert # 125 with the 12th Never-Ending Tour Band: Bob Dylan (vocal & guitar), Charlie Sexton (guitar), Larry Campbell (guitar, mandolin, pedal steel guitar & electric slide guitar), Tony Garnier (bass), David Kemper (drums & percussion). 4, 10, 11 Bob Dylan harmonica. 1, 6, 15, 17 Larry Campbell & Charlie Sexton (backup vocals). 7 new songs (41%) compared to previous concert. 1 new song for this tour. Session info updated 26 April 2001. Concert # 1221 of The Never-Ending Tour. Concert # 12 of the 2000 US Summer Tour with Phil Lesh And Friends. Concert # 126 with the 12th Never-Ending Tour Band: Bob Dylan (vocal & guitar), Charlie Sexton (guitar), Larry Campbell (guitar, mandolin, pedal steel guitar & electric slide guitar), Tony Garnier (bass), David Kemper (drums & percussion). 1, 4 Larry Campbell & Charlie Sexton (backup vocals). 11 new songs (68%) compared to previous concert. 1 new song for this tour. Concert # 1222 of The Never-Ending Tour. Concert # 13 of the 2000 US Summer Tour with Phil Lesh And Friends. Concert # 127 with the 12th Never-Ending Tour Band: Bob Dylan (vocal & guitar), Charlie Sexton (guitar), Larry Campbell (guitar, mandolin, pedal steel guitar & electric slide guitar), Tony Garnier (bass), David Kemper (drums & percussion). Concert # 1223 of The Never-Ending Tour. Concert # 14 of the 2000 US Summer Tour with Phil Lesh And Friends. Concert # 128 with the 12th Never-Ending Tour Band: Bob Dylan (vocal & guitar), Charlie Sexton (guitar), Larry Campbell (guitar, mandolin, pedal steel guitar & electric slide guitar), Tony Garnier (bass), David Kemper (drums & percussion). 12 new songs (70%) compared to previous concert. 3 new songs for this tour. Concert # 1224 of The Never-Ending Tour. Concert # 15 of the 2000 US Summer Tour with Phil Lesh And Friends. Concert # 129 with the 12th Never-Ending Tour Band: Bob Dylan (vocal & guitar), Charlie Sexton (guitar), Larry Campbell (guitar, mandolin, pedal steel guitar & electric slide guitar), Tony Garnier (bass), David Kemper (drums & percussion). 1–5, 14 acoustic with the band. 9, 10 Bob Dylan harmonica. 1, 5 Larry Campbell & Charlie Sexton (backup vocals). On the drums, my drummer, David Kemper. We went golfing today. David wore two shirts. In case he'd get a hole in one. (after Drifter’s Escape during band credits). 7 new songs (46%) compared to previous concert. 1 new song for this tour. Concert # 1225 of The Never-Ending Tour. Concert # 16 of the 2000 US Summer Tour with Phil Lesh And Friends. Concert # 130 with the 12th Never-Ending Tour Band: Bob Dylan (vocal & guitar), Charlie Sexton (guitar), Larry Campbell (guitar, mandolin, pedal steel guitar & electric slide guitar), Tony Garnier (bass), David Kemper (drums & percussion). 7 new songs (41%) compared to previous concert. 3 new songs for this tour. Concert # 1226 of The Never-Ending Tour. Concert # 17 of the 2000 US Summer Tour with Phil Lesh And Friends. Concert # 131 with the 12th Never-Ending Tour Band: Bob Dylan (vocal & guitar), Charlie Sexton (guitar), Larry Campbell (guitar, mandolin, pedal steel guitar & electric slide guitar), Tony Garnier (bass), David Kemper (drums & percussion). Concert # 1227 of The Never-Ending Tour. Concert # 18 of the 2000 US Summer Tour with Phil Lesh And Friends. Concert # 132 with the 12th Never-Ending Tour Band: Bob Dylan (vocal & guitar), Charlie Sexton (guitar), Larry Campbell (guitar, mandolin, pedal steel guitar & electric slide guitar), Tony Garnier (bass), David Kemper (drums & percussion). Concert # 1228 of The Never-Ending Tour. Concert # 19 of the 2000 US Summer Tour with Phil Lesh And Friends. Concert # 133 with the 12th Never-Ending Tour Band: Bob Dylan (vocal & guitar), Charlie Sexton (guitar), Larry Campbell (guitar, mandolin, pedal steel guitar & electric slide guitar), Tony Garnier (bass), David Kemper (drums & percussion). 5 new songs (31%) compared to previous concert. 1 new song for this tour. Concert # 1229 of The Never-Ending Tour. Concert # 20 of the 2000 US Summer Tour with Phil Lesh And Friends. Concert # 134 with the 12th Never-Ending Tour Band: Bob Dylan (vocal & guitar), Charlie Sexton (guitar), Larry Campbell (guitar, mandolin, pedal steel guitar & electric slide guitar), Tony Garnier (bass), David Kemper (drums & percussion). Concert # 1230 of The Never-Ending Tour. Concert # 21 of the 2000 US Summer Tour with Phil Lesh And Friends. Concert # 135 with the 12th Never-Ending Tour Band: Bob Dylan (vocal & guitar), Charlie Sexton (guitar), Larry Campbell (guitar, mandolin, pedal steel guitar & electric slide guitar), Tony Garnier (bass), David Kemper (drums & percussion). 7 new songs (41%) compared to previous concert. No new songs for this tour. Session info updated 22 April 2016. Concert # 1231 of The Never-Ending Tour. Concert # 22 of the 2000 US Summer Tour with Phil Lesh And Friends. Concert # 136 with the 12th Never-Ending Tour Band: Bob Dylan (vocal & guitar), Charlie Sexton (guitar), Larry Campbell (guitar, mandolin, pedal steel guitar & electric slide guitar), Tony Garnier (bass), David Kemper (drums & percussion). 2, 11, 15 Bob Dylan harmonica. 8 new songs (47%) compared to previous concert. No new songs for this tour. Concert # 1232 of The Never-Ending Tour. Concert # 23 of the 2000 US Summer Tour with Phil Lesh And Friends. Concert # 137 with the 12th Never-Ending Tour Band: Bob Dylan (vocal & guitar), Charlie Sexton (guitar), Larry Campbell (guitar, mandolin, pedal steel guitar & electric slide guitar), Tony Garnier (bass), David Kemper (drums & percussion). Session info updated 2 August 2000. Concert # 1233 of The Never-Ending Tour. Concert # 24 of the 2000 US Summer Tour with Phil Lesh And Friends. Concert # 138 with the 12th Never-Ending Tour Band: Bob Dylan (vocal & guitar), Charlie Sexton (guitar), Larry Campbell (guitar, mandolin, pedal steel guitar & electric slide guitar), Tony Garnier (bass), David Kemper (drums & percussion). Concert # 1234 of The Never-Ending Tour. Concert # 25 of the 2000 US Summer Tour with Phil Lesh And Friends. Concert # 139 with the 12th Never-Ending Tour Band: Bob Dylan (vocal & guitar), Charlie Sexton (guitar), Larry Campbell (guitar, mandolin, pedal steel guitar & electric slide guitar), Tony Garnier (bass), David Kemper (drums & percussion). 9 new songs (52%) compared to previous concert. No new songs for this tour. Session info updated 1 June 2011. Concert # 1235 of The Never-Ending Tour. Concert # 26 of the 2000 US Summer Tour with Phil Lesh And Friends. Concert # 140 with the 12th Never-Ending Tour Band: Bob Dylan (vocal & guitar), Charlie Sexton (guitar), Larry Campbell (guitar, mandolin, pedal steel guitar & electric slide guitar), Tony Garnier (bass), David Kemper (drums & percussion). Concert # 1236 of The Never-Ending Tour. Concert # 27 of the 2000 US Summer Tour with Phil Lesh And Friends. Concert # 141 with the 12th Never-Ending Tour Band: Bob Dylan (vocal & guitar), Charlie Sexton (guitar), Larry Campbell (guitar, mandolin, pedal steel guitar & electric slide guitar), Tony Garnier (bass), David Kemper (drums & percussion). 5 new songs (29%) compared to previous concert. No new songs for this tour. Concert # 1237 of The Never-Ending Tour. Concert # 28 of the 2000 US Summer Tour with Phil Lesh And Friends. Concert # 142 with the 12th Never-Ending Tour Band: Bob Dylan (vocal & guitar), Charlie Sexton (guitar), Larry Campbell (guitar, mandolin, pedal steel guitar & electric slide guitar), Tony Garnier (bass), David Kemper (drums & percussion). Concert # 1238 of The Never-Ending Tour. Concert # 29 of the 2000 US Summer Tour with Phil Lesh And Friends. Concert # 143 with the 12th Never-Ending Tour Band: Bob Dylan (vocal & guitar), Charlie Sexton (guitar), Larry Campbell (guitar, mandolin, pedal steel guitar & electric slide guitar), Tony Garnier (bass), David Kemper (drums & percussion). Concert # 1239 of The Never-Ending Tour. Concert # 30 of the 2000 US Summer Tour with Phil Lesh And Friends. Concert # 144 with the 12th Never-Ending Tour Band: Bob Dylan (vocal & guitar), Charlie Sexton (guitar), Larry Campbell (guitar, mandolin, pedal steel guitar & electric slide guitar), Tony Garnier (bass), David Kemper (drums & percussion). 1, 2, 17 Larry Campbell & Charlie Sexton (backup vocals). That was a sad story, here is a sadder one (after Long Black Veil). We're getting wet, too! (after band credits, before Leoprad-Skin Pill-Box Hat). Session info updated 15 February 2001. Concert # 1240 of The Never-Ending Tour. Concert # 31 of the 2000 US Summer Tour with Phil Lesh And Friends. Concert # 145 with the 12th Never-Ending Tour Band: Bob Dylan (vocal & guitar), Charlie Sexton (guitar), Larry Campbell (guitar, mandolin, pedal steel guitar & electric slide guitar), Tony Garnier (bass), David Kemper (drums & percussion). 1, 6, 17 Larry Campbell & Charlie Sexton (backup vocals). On the drums David Kemper. Last night David took a hammer and he hit the sack. ........ David didn't even go to bed and he hit the sack (during band credits, after Cold Iron Bounds). Concert # 1241 of The Never-Ending Tour. Concert # 32 of the 2000 US Summer Tour with Phil Lesh And Friends. Concert # 146 with the 12th Never-Ending Tour Band: Bob Dylan (vocal & guitar), Charlie Sexton (guitar), Larry Campbell (guitar, mandolin, pedal steel guitar & electric slide guitar), Tony Garnier (bass), David Kemper (drums & percussion). 6 new songs (35%) compared to previous concert. 2 new songs for this tour. Concert # 1242 of The Never-Ending Tour. Concert # 33 of the 2000 US Summer Tour with Phil Lesh And Friends. Concert # 147 with the 12th Never-Ending Tour Band: Bob Dylan (vocal & guitar), Charlie Sexton (guitar), Larry Campbell (guitar, mandolin, pedal steel guitar & electric slide guitar), Tony Garnier (bass), David Kemper (drums & percussion). 4, 5, 15 Bob Dylan harmonica. Thank you, everybody from the good state of New Jersey! (after Duncan And Brady). Thank you, ladies and Gentlemen, I want to introduce my band to you right now, some of the finest players in the country. On the guitar — Larry Campbell! On the drums, none other than David Kemper! Charlie Sexton's on the other guitar. Session info updated 20 August 2014.